Cabasse launches Eole 4 speaker package with slimline subwoofer | What Hi-Fi? One of the most distinctive-looking 5.1 speaker packages on the market has had a refresh. 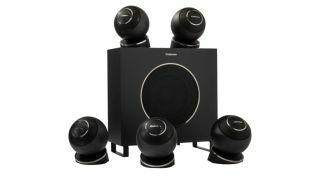 The Cabasse Eole 4 is, unsurprisingly, the fourth iteration of the company's spherical speaker system. All five satellites use a coaxial driver, consisting of a 29mm dome tweeter and 10cm mid/bass driver. New for the Eole 4 are the grille and mounting base designs. The grilles have a more open profile to help transparency and high frequency response, while the new magnetic base design gives the owner greater flexibility over positioning - you can rotate the speakers and get them firing in the exact direction required. The cherry on this system is Cabasse's new slimline 400W subwoofer, called Lipari 21. At only 15cm wide, it can be positioned tight to a wall and even under furniture. The Cabasse Eole 4 is available now in either black or white for £899.